The multi-award-winning Karoq and Kodiaq ranges are about to become even broader with the introduction of a new 2.0 TSI 190PS engine option. With demand for ŠKODA petrol engines continuing to grow, the new powerplant is the perfect option for drivers looking to combine agile performance with exceptional refinement and efficiency. Karoq customers can specify the new engine in SportLine form, with prices starting from £31,820 OTR. The engine develops 320Nm of torque between 1,400 and 4,100rpm and delivers its power to the road via a standard seven-speed DSG gearbox and four-wheel drive. It can complete the sprint from 0-62mph in just 7.0 seconds, making it the fastest Karoq in the range. Despite its strong performance, the 2.0 TSI 190PS engine is remarkably efficient – returning 33.2- 32.1mpg on the WLTP combined cycle and emitting 158g/km of CO2. 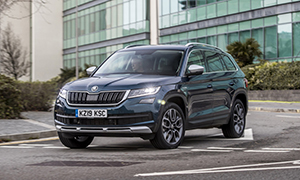 In the Kodiaq, the new engine is available on the SE L, Scout, SportLine, Edition and L&K equipment levels and is fitted with a seven-speed DSG and four-wheel drive as standard. Prices for Kodiaq models equipped with the new engine range at £34,120 OTR for the seven-seat SE L model up to £38,770 OTR for the seven-seat L&K variant. In terms of performance, the 2.0 TSI 190PS Kodiaq can sprint from zero to 62mph in just 7.7 seconds. Fuel consumption varies according to model with most frugal being the SE L model that returns 31.7 - 30.1mpg on the WLTP combined cycle. CO2 emissions for this model are 162g/km.